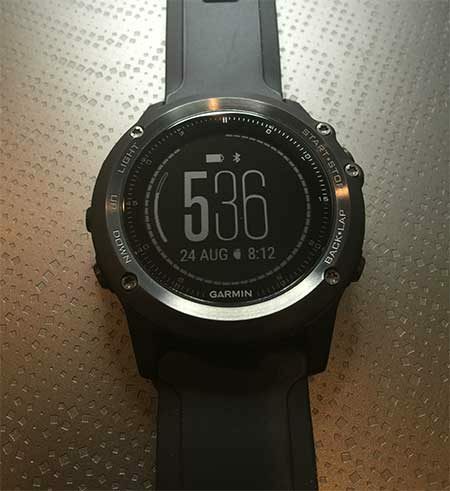 My Garmin Fenix 3 HR Review: In my quest for the perfect fitness watch, I recently came across the Garmin Fenix 3 Sapphire Edition. This model comes with a built in heart rate sensor and also ships bundled with a heart rate strap. It was necessary to do a lot of research before proceeding to purchase. Comparing features between brands, prices, durability, etc. I’ll start by pointing out that this Fitness watch is absolutely beautiful. With its dark anodized brushed finish, overall clean design, and well organized button layout. The Garmin Fenix 3 HR looks and feels like a high quality digital watch. The Fenix 3 definitely stands out on any wrist. Though large and tough to get used to wearing at first. I Initially found myself brushing the watch up against things like doors, trim etc due to its pure size. That might sound strange, but the watch is much larger than the standard wrist watch. After a few days, bumping into things no longer became a concern. As mentioned earlier, the Garmin Fenix 3 HR Sapphire Edition comes bundled with an external heart rate strap. HR denotes Garmins built in Elevate™ wrist heart rate technology consisting of a heart rate sensor built into the watch which measures heart rate at your wrist. In testing, heart rate measurements at the wrist appeared fairly accurate while sedentary or while minimally active. However, I found that measuring heart rate at the wrist wasn’t accurate during intense exercise. 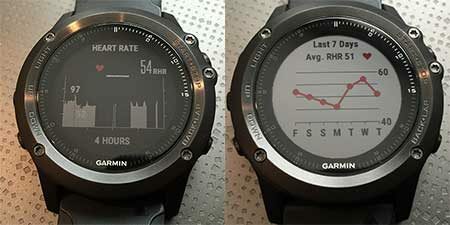 During intense exercises, I found wrist readings to be off by as much as 60bpm, and slow to update. Therefore, I eventually reverted to using the included heart strap only while exercising for more accurate readings. 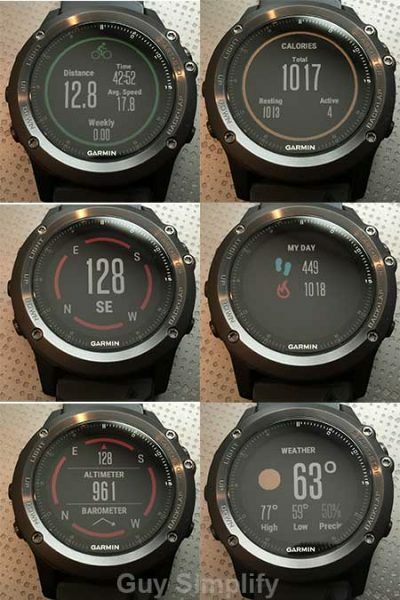 The Fenix 3 HR is packed with plenty of features. Standard watch features include the essential time, date, and time to sunset/sunrise. Built in sensors include GPS/GLONASS, altimeter, barometer, thermometer, bluetooth, ANT+, Wi-Fi, and compass. The main display layout can also be adjusted. Along with the ability to move, add or delete pages. Pages are easily toggled via the up or down buttons. Watch faces and data fields can be customized. Moreover, there are tons of free apps available through Connect IQ. Like many other smart fitness watches the Fenix 3 features a built in step monitor to keep track of steps taken throughout the day. A simple calorie monitor to help monitor what your body is burning throughout the day. A sleep monitor to help monitor sleep patterns, and resting heart rate. A nifty navigation with TracBack feature with markers which can be used to take you back to your starting point via the route you took. Weather monitor and alerts (requires paired smartphone connection). VO2 max estimator. Smartphone email, text, and call notifications are displayed on the watch. Advanced Running Dynamics and Physiological Metrics that help monitor nearly every aspect of your performance. The Fenix 3 HR watch can be used for walking, running, swimming, paddle sports, skiing, golfing, cycling, weight training and more. Perhaps one the the coolest features is the ability to upload and study the data stored on the Fenix 3 Smart Fitness Watch via Garmin Express. I’ve been using this smart watch for several months now and absolutely love it. The watch makes a great companion to my phone for receiving notifications and viewing critical data at my wrist. As a result, I find myself using the Garmin Fenix 3 in place of my Garmin Edge 800 for cycling. Overall, its feature support is awesome. Moreover, Garmin Connect is easy to use and works great for organizing data.